When Teena was in BC last month, she brought me back quite a few beers that I can't get here. Among them were two bottles from Tin Whistle Brewing in Penticton, BC. I have researched the web like I always do and could not find a website. In fact, I could not find out much of anything about this company. So to the bottle! Now I'm interested. 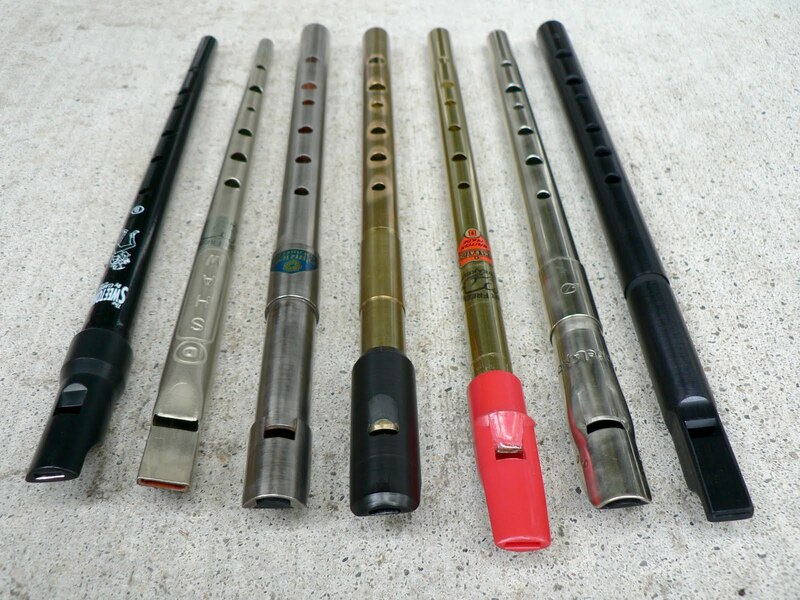 What is a tin whistle? To the right is a picture of a few. Turns out a tin whistle is a style of flute used mainly in Celtic Music. In fact if you care to hear what they sound like the Tin Whistle link has many videos on it. Nice of the brewery to promote this musical instrument! All I could find on the brewery was from BC Beer ... "A small brewery producing English-style ales. Started in 1995 by local entrepreneurs with an interest in beer but little brewing experience. With the help of brewery consultant Frank Appleton, they soon got up to speed. Products were initially sold in kegs and 650ml bottles. The brewery was sold in the winter of 1998, although ownership has remained local. After flying low on the radar for a while, the brewery has produced some solid products in recent years"
I have two to try, so first off I am going to have a Killer Bee Honey Dark Honey Ale. Somewhere I read it uses 4 honeys and a bit of spice. It comes in a 650 ml bottle and weighs in at 6% APV. It pours a very dark brown colour. You can't see through this beer. It has a very malty aroma. The head is brownish in colour and leaves behind very nice lacings as it disappears. It is not as sweet as I expected it to be. Listed as a dark ale, it seems more like a stout with hints of coffee and chocolate coming through from the roasted malt. It is a very smooth beer with a slightly bitter finish which comes not from the hops, but again from the roasted malt. At 6% and being dark, I expected a fuller tasting beer. This is not, in fact, it is a little like a porter light. Only at 6%, it;s the other side of a light beer. A good beer, but not one I would run out to buy. Next up is the Black Widow Mild Ale. Not sure what to expect as at 5% it is not a light beer so am unsure what to expect. Like the last one, this too pours a dark brown colour. The head is thicker and takes longer to melt away. Lacings too are fuller down the side of the glass. The roasted malt again comes to the front but with this one is also complimented by a slight hoppyness. It is a fuller, more complex taste than the honey ale. I enjoyed this beer and am very happy that Teena brought this one back for me to try. I still can't figure out why they call it a mild ale though. Also can't figure why they don't have a website of any kind. In this day and age it is very important for a business. Once again, thanks, Teena, for thinking about me when your away!